The Giant Sequoia Trees – they’re on everyone’s travel bucket list – draw awestruck visitors from all around the world. 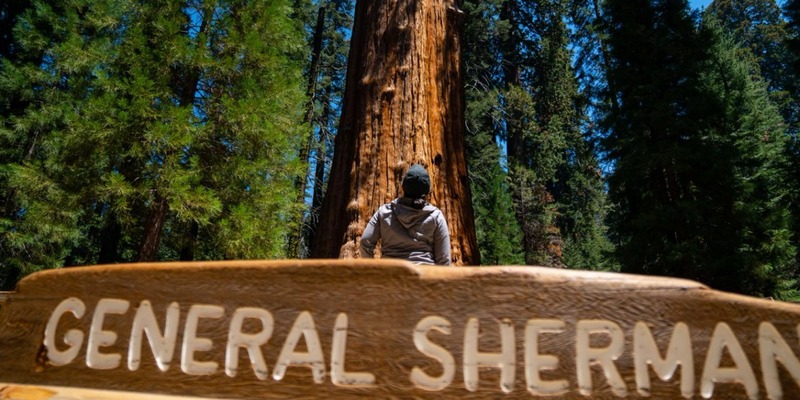 Happily, our location just minutes from the gate of Sequoia National Park, makes these massive trees, right here in our very own backyard, easy to visit, and we welcome thousands who come to marvel at their majesty. But that’s not all – Kings Canyon National Park is close by, too. And mighty Yosemite isn’t far away. Active folks and those of a more contemplative nature alike will find everything they’ve dreamed of here: an abundance of outdoor adventure for all ages and skill levels, and the serenity of natural tranquility in some of the world’s most magnificent surroundings. Visitors enjoy hiking, biking, camping, swimming – and exploring the unique natural features of each park. If you’re going to be with us for a few days, we’re the starting point for the Majestic Mountain Loop that takes you to three national parks in as little as three days. Visalia is definitely your best bet as home base, with lodging options for all budgets, a family-friendly atmosphere, and plenty of things to do when you’re not at the parks. So come and visit. We’ll help you make your travel dreams come true.